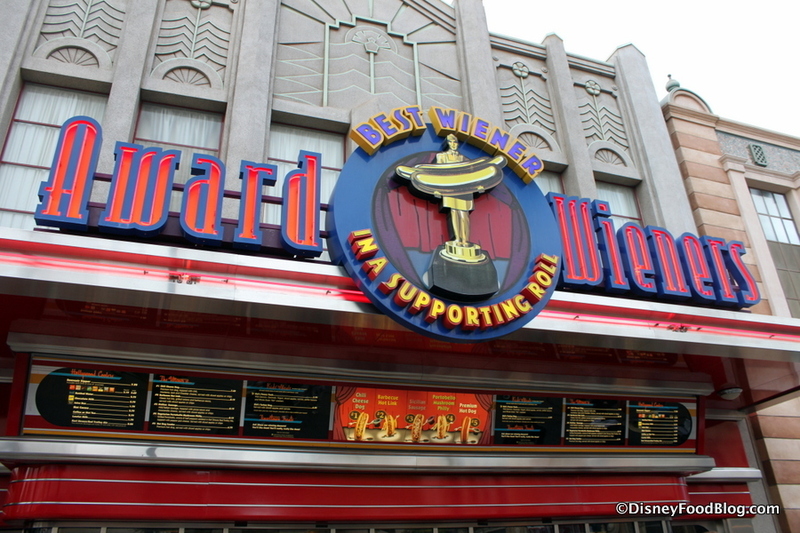 Award Wieners is an old Hollywood style counter service joint in Disney California Adventure. It’s located in Hollywood Land, which isn’t surprising when you see the sleek art deco exterior. I mean, check out that wiener award in the center of the marquee. So shiny. So golden. So hot dog-y. And the good news is, if you were wondering where you could see images of dancing hot dogs in top hats, Award Wieners has something for you, there. Naturally, we had to try something a little more creative than your basic dog (although that’ll satisfy any day of the week! 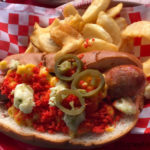 ), so we ordered the BBQ Crunch Dog. Which is an epic favorite here at DFB. It’s a Cheddar Sausage, which is salty and tasty with just a hint of creamy cheddar. 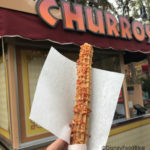 Then, to kick the show into high gear, Award Wieners tops the sausage with Barbecue Sauce, Cheddar Jack Cheese, and crispy Fried Onions. All of these toppings are “wieners”, we know. Our only complaint is that the cheese didn’t really melt. So that was disappointing, but otherwise, this works! The Barbecue Sauce is a little bit sweet and a little (tiny) bit spicy. 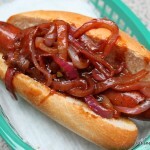 But the sausage was delicious, and the Fried Onions performed an essential supporting role by adding texture. We also dig the toasted Potato Bun. It couldn’t contain all of the toppings, but it tasted awesome. You have a choice between Seasonal Fruit or “Filmstrip” Fries on the side. 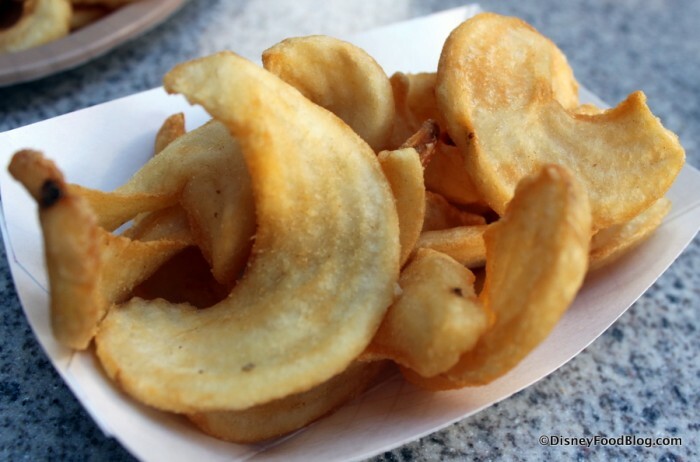 We’ve heard them called twisty fries or (our personal favorite) curly steak fries by fans. The second description is pretty apt. These are thick cut fries that are curled, creating a unique French fry shape. But fear not — they are *distinctly* fries; they’re not crispy like chips at all. 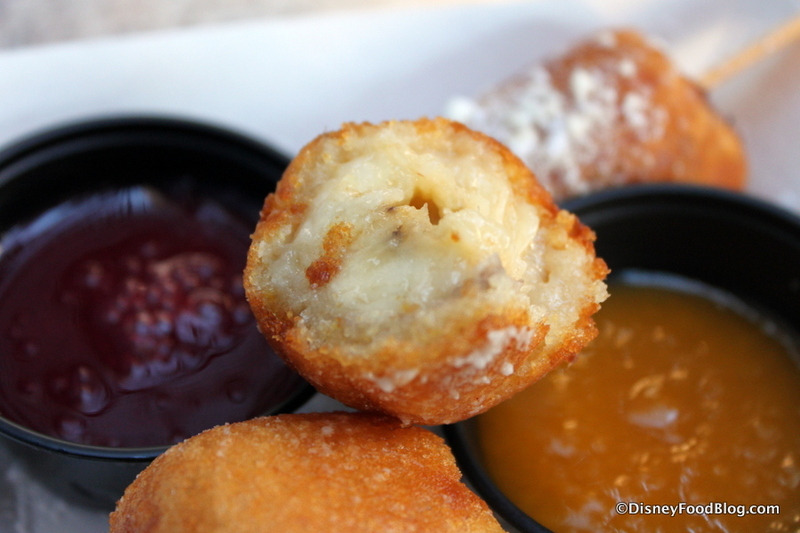 Now, it’s no secret that we are big, big fans of Disneyland corn dogs. There’s just nothing like this iconic snack anywhere. 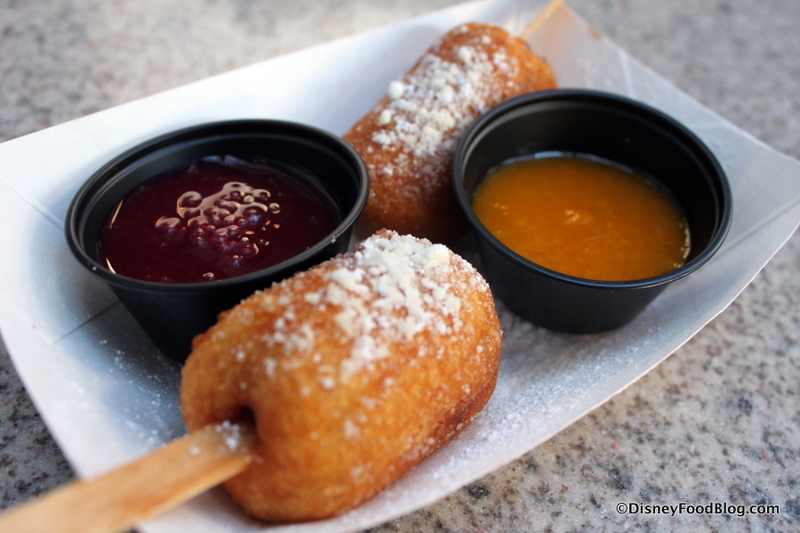 (Even the Disneyland corn dog cousins at the Fantasy Fare Food Truck aren’t quite the same.) So we had to give the Banana Corn Dogs a try. Or maybe they’re just called Fried Bananas. But they sure to LOOK like banana corn dogs to us. These are what you think they are. Two inch chunks of banana are dunked in a batter, and deep fried. When they’re golden brown, they’re topped with a little Powdered Sugar and served with two sauces: Raspberry and Mango. Mango! This was a provocative and tasty snack. (Really, name something deep fried and dunked in sauce that isn’t tasty.) The banana is soft, but that cornmeal batter has a great little crunch. The sauces are tart and sweet and delicious. And there’s plenty of them to go around since you’re only scoring two Banana Corn Dogs with your order. At $5.99, these aren’t the biggest snack you can get, but they’re darn good. We’re stoked that these are back after their limited run back when Zootopia was released. Get ’em while you can! Overall, we have no big complaints about Award Wieners. There’s always something surprising on the menu, and it’s pretty much always good. Plus, it’s super convenient, located near crowd favorite Monsters Inc. (and in the shadow of the Tower of Terror as it gets its Guardians of the Galaxy reboot). 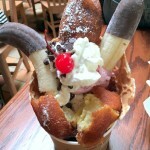 Is this where you should eat in Disney California Adventure? Well, a couple of years back I would have said you can skip it. But honestly the menu revamps have made it almost a must-visit for me. 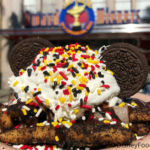 Flo’s V-8 Cafe is probably my number one counter service recommendation here, and Boardwalk Pizza and Pasta and Paradise Garden Grill are offering some great options, too. But Award Wieners, man…it brings it. And here’s a DFB Tip: when you choose this restaurant, don’t be fooled that it looks like there’s no seating whatsoever. There’s actually plenty of seating. After getting your food, walk around behind Award Wieners and you’ll find tables upon tables under cover. Good deal. 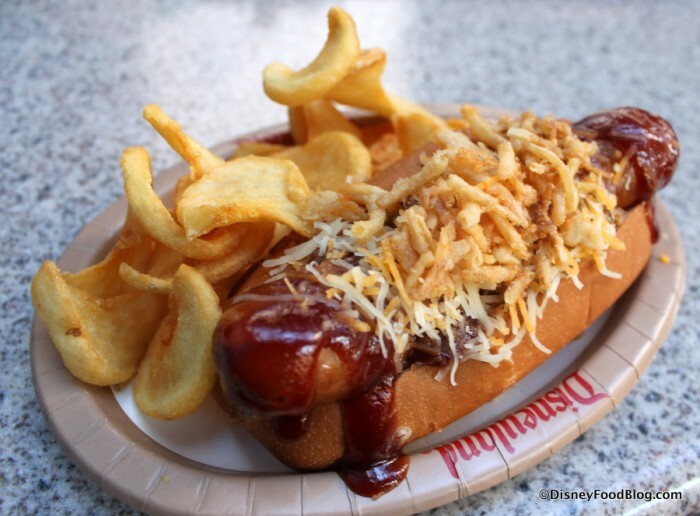 Are you a Disney hot dog fan? Let us know all about your fave in the comments below! I hope they will get all this at DW. I love hot dogs with the emphasis on hot. There’s nothing more disappointing than getting a hot dog that’s cold! lol The banana dogs look fun and tasty. We found on this visit that they’ve changed the portabello sandwich to be on potato bread instead of a bun like the other hot dogs. The portion seemed to us to be significantly smaller as a result, and less filling. This was a bummer, as it’s been reliably one of our favorite vegetarian options in California Adventure.